An important part of the experience at Enchanted Lake Lodge is immersing yourself in our natural surroundings. 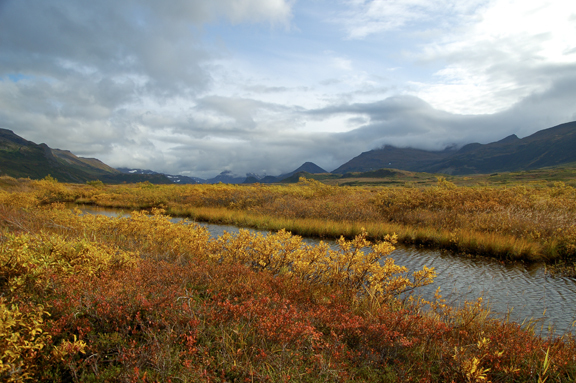 At 4.2 million acres, Katmai National Park is the second largest park in the United States. Katmai is a land that time has forgotten. On a clear day, the 'Valley of 10,000 Smokes' is a sight to behold, with its lava covered floor and steaming volcanoes. Glistening turquoise glaciers, long cascading waterfalls, and a multitude of natural wonders are found in this vast landscape. Enchanted Lake Lodge, located in Katmai National Park, is at the center of this natural splendor and yours to enjoy. Katmai is also home to moose, caribou, wolves and the ever present bald eagle. Enchanted Lake Lodge is your doorway to all that Katmai National Park has to offer - "The very best of the very last" is here waiting for you. In addition to an unparalleled angling experience, we are happy to offer our guests an opportunity to view and photograph the many natural wonders and abundant wildlife in our area. And, of course, there are always plenty of bears to watch frolic and fish during the salmon runs. The Alaskan brown bear, master of the wilderness, is a common partner on numerous fishing streams. You may fish side by side with these majestic creatures as they feed on the plentiful salmon. Literally millions of salmon invade the park waters each year on their long journey back to their birthplace.